Phenology- Tracking the seasons through the events of nature. Each spring I record the first Robin and its location, weather and date and do this for many of our migratory species that I observe in Minnesota. 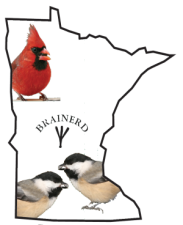 A few other examples of Phenology for Minnesota would be the Great Horned Owl one of the earliest nesting birds (Feb./March) and one of the first migrants to the state is the Horned Lark (Jan./Feb.) Happy Birding! 03/30/10-Bluebird,American kestrel,Northern Harrier,Killdeer Aitkin Co.first 70 degree day! 04/06/10-Common Loon Hartley Lake nested here last year and raised two young! 04/09/2011-Northern Shovelar, Northern Flicker, Bufflehead, Meadowlark, Song Sparrow, Blue-winged Teal, Woodduck, Belted Kingfisher, Common Merganser, Red Head, Northern Harrier and Golden-crowned Kinglet. Mississippi River (Brainerd) Aitkin Co Bird Guiding Trip.